Vision, Dexterity and Distractions continually limit the effectiveness and reliability of diagnostic measurements. Technicians and engineers equipped with the most advanced test instruments still have to locate the test point, place the probe and take the measurement. High density circuit components are difficult to see and often require magnification devices. Measurement points can be small and close together. 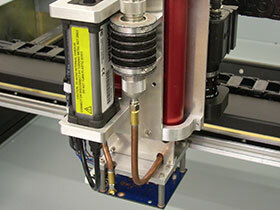 Accurate probe placement and repeatable measurements can be difficult. Interruptions by telephones, coworkers, pages and meetings can take their toll on completing a test procedure. Start by identifying the process that needs to be automated and then consider the requirements that will fix your problem. 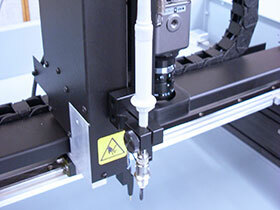 Define the accuracy, speed and number of test points you require then look at the robotic platform options available. Lastly, consider the price versus the cost savings in reduced test time, fewer misplaced probes and lower burden on engineering resources. Testing methods for low-volume and prototype circuit boards are becoming harder with the increasing complexity and density. Low-volume production runs or prototypes do not normally justify the cost of bed-of-nails in-circuit testing. The use of flying probe technology provides a cost-effective solution. In repair situations it is often necessary to test the board without power applied due to uncertainty as to the nature of the failure. Eliminate manual sniffer probes methods by automating the placemnt of the RF probe with an Access Prober. Accurately measure voltage, resistance, current, capacitance, inductance and differential measurements between two points on a printed circuit assembly. Debug, fault injection, electrical transient monitoring and sustained engineering applications. Use of the probes as independent cells to increase test coverage of interconnects and clusters of logic, memories etc. Physical contact, minimum impact on circuit operation, adequate signal fidelity, especially for high-density surface mount technology. Passive, active, differential, logic and current probes can be mounted. Add fixed probe arrays to access a number of points at one time. Maximum downforce is up to 5 lbs. 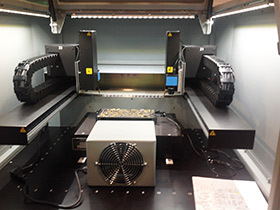 Custom integration of unique applications such as vision, infrared mapping, temperature sensing and mechanical manipulation. Huntron currently manufactures three styles of Access Robotic Probers. More detailed information is available on the Access Probers web page. Larger single head prober well suited to larger PCAs.